I want to be a Happy Hoofer! They travel to awesome places and dance. Sometimes they tap their way right into a bunch of trouble but they always seem to shuffle their way out! If you haven’t met the Happy Hoofers they are a group of friends that love to dance. Janice narrates the story this time. The girls are in Paris and are booked to perform for a week on the Bateau Mouche, a touristy sightseeing boat that travels down the Seine. At the end of their first night passengers are guided to the top deck of the ship to see the Bastille Day fireworks but what they find is a dead body. This is not the first murder the Hoofers have found. They have become pretty well versed in police investigations and they can’t stop themselves from doing a bit of investigating on their own. They are going to have to kick up more than their heels to catch this killer. This is the second book I have read recently that takes place in Paris. Mary McHugh does an excellent job or describing the “City of Light”. The dancers are staying in a rented apartment and their schedule leaves them plenty of time to see the famous landmarks and partake in some of the culinary delights from places around the city. They even take a trip to Versailles castle and gardens. I would really love to actually visit Paris someday. For now I have to settle for these virtual trips. The mystery is fun too. Following the clues right along with the ladies. I figured it out a bit before them and I wish I could have let them know because one of them gets themselves into quite a pickle. The story wraps up almost too quickly for me though. I liked the way it played out but a few more pages of danger would have really added to the suspense level. You had me at cancans. Love the dance. I just discovered this series and have the first one ready to read. Looking forward to checking this series out. Thank you for the giveaway. 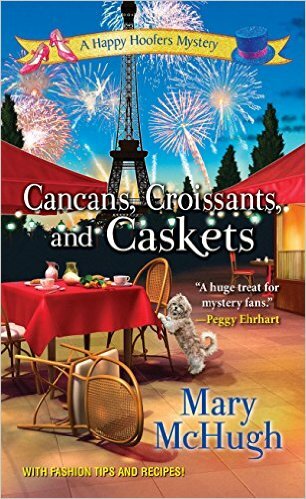 Cancans, Croissants and Caskets sounds like a fun read, and they get to travel! 🙂 I am looking forward to reading the books in this series. Thank you for the review and giveaway. Thanks for the giveaway! My mom loves this series and I’d love to win it for her! I’m not sure if my previous comment went through. Paris is a great setting. Can;t wait to read it. I LOVE the Happy Hoofers!! What fun to travel and dance your way around the world! I enjoy series. Thanks for a chance to win. I loved “Flamenco, Flan and Fatalities” and am really looking forward to reading this book as well! I haven’t read any of her books but this sounds like fun. I’d love the chance to read it. I am a sucker for anything French, so this book is very exciting to me! I am so in! This sounds like a really fun cozy. Thanks for the opportunity. I’d like to meet The Happy Hoofers and visit Paris. Sounds fun! What a great title, oh how I remember the days of can-cans, I loved wearing them!